Flyers' Carter Hart (79) blocks a shot during a game against the New York Islanders at the Wells Fargo Center in South Philadelphia on Saturday, March 23, 2019. 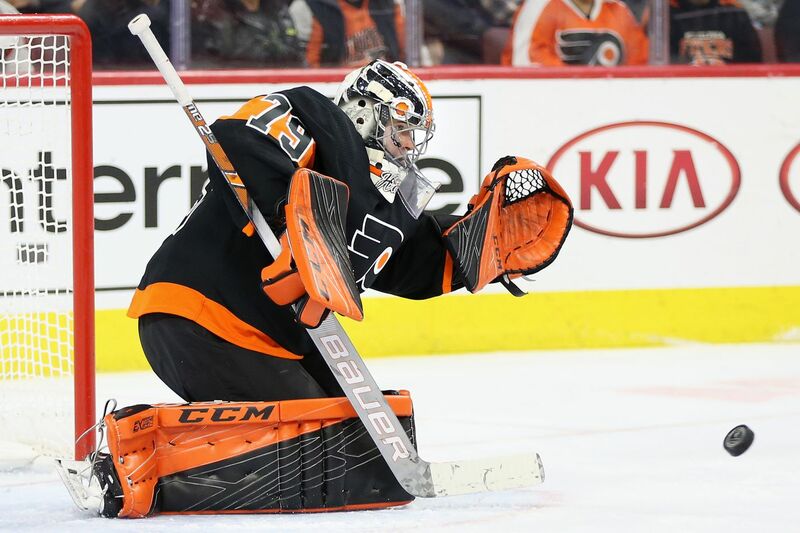 The Flyers gave up two third-period goals, and watched their playoff hopes take yet another major hit Saturday, as they lost to the Islanders, 4-2, at the Wells Fargo Center in a Saturday matinee. Islanders winger Josh Bailey beat Flyers goalie Carter Hart’s glove side with 3 minutes, 57 seconds left in the game for the go-ahead goal. The Flyers, who entered the day five points behind the Montreal Canadiens for the final wild card spot, were outshot, 40-24. “I think we were just slow to close on people,” Flyers interim coach Scott Gordon said. “It’s one thing to be stuck in your zone, it’s another thing [not] being in the right places when you’re stuck in your zone." Bailey netted a second goal, a dagger off a pass from winger Leo Komarov, to give the Isles a two-goal advantage, with 2:24 left in the game. A Shayne Gostisbehere power-play goal had given the Flyers temporary life earlier in the third period, about two minutes after Hart made a handful of big saves during a 5-on-3 penalty kill. Gostisbehere beat Islanders goalie Robin Lehner with a slapshot seconds into a power play set up by a Scott Mayfield hooking penalty. Mayfield helped draw a controversial goalie interference call on Flyers winger Ryan Hartman that gave the Isles the two-man advantage after Jake Voracek picked up two minutes for unsportsmanlike conduct (arguing with the officials), resulting in the Isles’ two-man advantage. Thanks to two errant passes out of the zone and a big save from the 20-year-old goalie trying to keep the Flyers’ season alive, the penalty was killed and the Flyers tied it up shortly after. But the Flyers struggled to control the puck for much of the final two periods, which proved to be too much for Hart to handle. The first period started with a heavy dose of special teams -- all within the first three minutes: Radko Gudas got a hooking penalty in the first minute of the game; Robert Hagg picked up a double-minor penalty for high-sticking; and the Isles got caught with too many men on the ice. Hagg’s stick was mistaken for an Islanders’ when he was called for the four-minute minor, and the official admitted his mistake to the defenseman between periods. “I was kind of [ticked] off, but there’s not much you can do,” Hagg said. “He was pretty good about it, he came up before the second period and kind of apologized. ... When a referee comes up and admits it, you can let it go." Hagg atoned for the faulty penalty, though, striking first for the Flyers with 13:21 left in the first period. Hagg’s slap shot deflected off the back boards and then off Isles center Casey Cizikas’ stick before bouncing off the back of Lehner’s glove into the net. But the Islanders got their own deflection goal as center Brock Nelson batted a puck midair off a skate to beat Hart and even things up with 5:33 left. “I didn’t think we built any momentum after we scored a goal,” Gordon said. The Flyers’ zone saw a lot of action in the second period, as they were outshot, 15-5. Defenseman Nick Leddy got a wrist shot past Hart’s stick with 9:58 left in the second period to give the Isles a 2-1 lead. Leddy was assisted by Isles defenseman Johnny Boychuk, who hadn’t played since taking a hard hit from Voracek in the teams’ last meeting on March 9. He missed a total of six games, five as a healthy scratch before returning to the ice. Other than picking up a point in his 16:23 of ice time, Boychuk didn’t produce any fireworks despite leaving the ice in New York pointing at Voracek and seeming to say, “I am going to get you." The Canadiens hosted the Buffalo Sabres later Saturday. The Islanders, now one point behind with the Capitals for first place in the Metropolitan Division, had lost their previous two games by a combined 9-0 margin. The Flyers don’t have much time to dwell on their bleak playoff chances; they go to Washington Sunday for a 12:30 game. Gordon said the grind of a months-long battle to keep the team’s hopes alive may be taking its toll.